“Listen to my story about a man named Jed, the poor mountaineer barely kept his family fed.” If you watched TV in the 60’s and 70’s, you know how catchy this song can be. However, within the first few bars, you soon realized the premise of the story and had a true feel for the Clampett family dynamics. Just like the Beverly Hillbillies, our residents have created their own song about life at Moosehaven, and the invaluable services provided. Within the first few notes, their song of salvation and gratitude quickly paint the picture of their own personal “why” Moosehaven is now their home. No matter the story line to follow, the underlying message within each song conveys the family dynamics of our community. Sit back and listen to the gentle melody written by Moosehaven residents from both admissions programs. Hear the common theme among the stories told by first-hand accounts from our family members. Jack joined the Moose in 1954. Without a thought for the future, Jack enjoyed his time with the Fraternity raising money for buildings here at Moosehaven and traveling the world. Little did Jack know at the time, his service in the Moose would one day gain him the best experience of his life. Years later, he now enjoys his retirement in one of the best communities in all his travels. With friendly faces to welcome him home, Jack sings the praises of a helpful staff and beautiful campus. A fairly new resident, Shirley, joined the Moose in 1985. Learning about the features of Moosehaven, Shirley knew instantly when touring, Moosehaven would become her home. 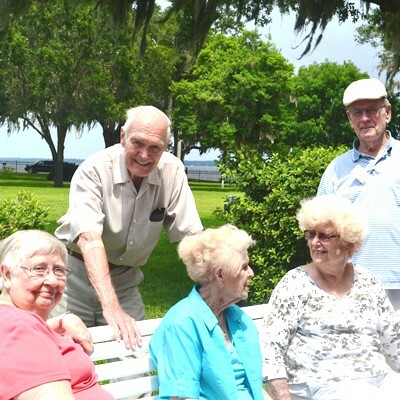 Eager to surround herself with friends of likeminded interest, Shirley feels blessed to be part of the Moosehaven family. After losing his wife, and part of himself, Jim lived near Moosehaven, but was sinking away in his home. Overwhelmed with the thought of downsizing and the loneliness he felt, Jim learned about the New Life Program at Moosehaven and had a ray of hope. The staff readily assisted him in the transition and with a song of gratitude; Jim quickly notes how Moosehaven saved his life. Changing his tune shunning the world, to thriving once again, Jim now has pep in his step and a new song in his heart. Not wanting to burden their children with the future task of downsizing, many of our Brandon Place residents have moved home to Moosehaven as soon as eligible. Eliminating the fear of the unknown with preparation, life is now a dance of a whole new beat. With the amenities and social activities offered on campus, life becomes carefree, without want or worry. Become part of the Moosehaven story, and write your next verse in life. Learn more about one of the greatest benefits of your Moose membership. Visit our admission page at www.moosehaven.org/admissions/, for information regarding our Moose Life Program for Moose members of 15 years, and our New Life Program. 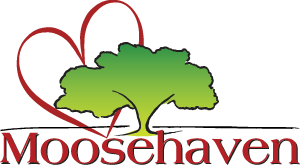 Don’t miss an episode of life at Moosehaven, like us today on Facebook to keep up to date with the latest events and news. You’ll soon hum a tune that resonates with your own lifestyle. Allow the uplifting melody to summon you home; where family and friends await you, to celebrate a harmonious life together and surround you in love.